The country of Azerbaijan is a semi-presidential republic, with the President of Azerbaijan as the head of state, and the Prime Minister of Azerbaijan as head of government. 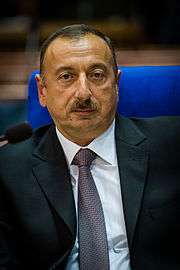 The current President of Azerbaijan is Ilham Aliyev. The Constitution states that the president will be the embodiment of executive power, commander-in-chief, "representative of Azerbaijan in home and foreign policies", and that he "shall have the right of immunity [from prosecution]." The president rules through his office at Presidential Apparatus, consisting of a group of secretaries and departmental ministers. Additionally, there is a Cabinet of Ministers (regarding economic and social policy) and a Security Council (regarding foreign, military, and judicial matters). Chief military advisors to the President of Azerbaijan have included: Turkish Air Force Brig. Gen. Yasar Demirbulak (1992–1994), Maj. Gen. Nuraddin Sadykhov (1993–1999), Col. Gen. Tofig Aghahuseynov (1997–2002) and National Security Lt. Gen. Vahid Aliyev (since April 2002). Among the agencies directly subordinate to the President is the Special State Protection Service. A candidate for office must be a citizen of Azerbaijan at least 35 years old, and 'permanently resided' in Azerbaijan for at least 5 years. The election of the President is mainly regulated by the Presidential Election Law (PEL) and the Basic Guarantees of Electoral Rights (BGL). Each faction in the National Assembly has the right to nominate a candidate for the presidential elections. The minimum number of signatures for a presidential candidate fielded by a political party with no parliamentary representation is 40,000, before amendments to the law. The standard is a square version of the Azerbaijani flag, charged in the center with the Azerbaijani coat of arms. Golden fringe is added to the standard. Copies of the standard are used inside his office, other state agencies, and while the president is traveling in a vehicle inside Azerbaijan. A 2:3 ratio version of the flag is used when the President is at sea. 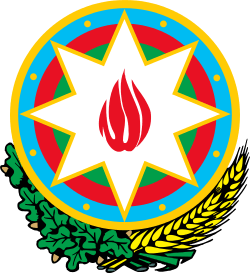 This is the most used symbol to denote the presence of the Azerbaijan President. As the guarantor of the Constitution and the entire system of constitutional law, the President ensures that the constitutions, laws and regulations of the constituent territories of the Azerbaijan be in full compliance with the country’s Constitution and federal laws. The President is invested with extensive rights to implement the state's foreign policy. The President determines Azerbaijan's position in international affairs and represents the state in international relations, conducts negotiations and signs ratification documents. The primary working President's residence is the The Presidential building (also known as Presidential apparatus) on Istiglaliyyat Street in Baku. The current (since 2008) home President's residence is Zagulba (Azerbaijani: Zaqulba). Also, the President has several vacation residences outside of Baku. 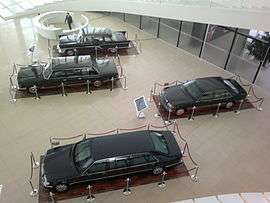 National transport services for the Azerbaijan President are provided by the Special Purpose Garage (SPG). The SPG is a unit within the Special State Protection Service. The presidential aircraft uses the same colour scheme as standard AZAL aircraft, except for the use of the Azerbaijan coat of arms or the Presidential Standard on the empennage instead of the flag of Azerbaijan. Nagorno-Karabakh War; Khojaly Massacre; Capture of Shusha; 1991 Azerbaijani Mil Mi-8 shootdown. Forced to submit his resignation after pressure from Azerbaijan Popular Front. Ousted by the armed revolt led by Azerbaijan Popular Front. Deposed from his duty after takeover by Azerbaijan Popular Front. Took temporary duties of president until the national elections in 1992. Among the Soviet republics the Russian army was first withdrawn from Azerbaijan; The national currency of Azerbaijan was put into circulation; State Treasure Foundation was established; Entrance examinations to he high and vocational educational was held with test method for the first time; The foundation of private institutions in the education field was permitted; The passage to the Latin alphabet; Founded the SOCAR; Re-established Azerbaijani Armed Forces; Operation Goranboy. Founded the YAP; Heydar Aliyev's cult of personality; Baku–Tbilisi–Ceyhan pipeline; South Caucasus Pipeline; 1994 Baku Metro bombings. Survived coup attempt in 1995. ↑ "AZƏRBAYCAN RESPUBLİKASINDA DÖVLƏT HAKİMİYYƏTİ HAQQINDA ÜMUMİ MƏLUMAT". www.taxes.gov.az (in Azerbaijani). Retrieved 10 August 2014. ↑ thato, phengo; begang, Rita James (2009). Voting and Elections the World Over. Global Perspectives on Social Issues Series. Lexington Books. p. 79. ISBN 978-0-7391-3090-2. ↑ "Ten Candidates Registered For Azerbaijani Presidential Election". www.rferl.org. Retrieved 28 October 2014. ↑ ВИЗИТ НЕ ВЕЖЛИВОСТИ. gazeta-nv.info (in Russian). Retrieved 10 August 2014. ↑ "Yaqub Məmmədov nurçuları Azərbaycana gətirənin adını açıqladı - MÜSAHİBƏ". publika.az (in Azerbaijani). Retrieved 19 August 2014. ↑ "İsa Qəmbər on adam.az". adam.az (in Azerbaijani). Retrieved 19 August 2014. ↑ Lewis, Paul. "H.A. 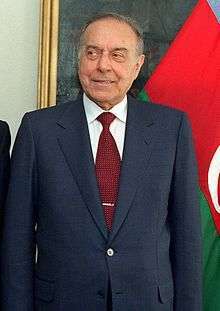 Aliyev, K.G.B. Officer And Azeri Leader, 80, Dies". www.nytimes.com. The New York Times. Retrieved 2 August 2014. ↑ "Azerbaijan's Ilham Aliyev claims election victory". www.bbc.co.uk. BBC. Retrieved 19 August 2014.